In 1990, Jack Kirby gave an interview in which he claimed sole responsibility for anything that had ever had Stan Lee's name on it. They were obviously the angry words of a bitter old man, but let's pretend for a moment he was telling the truth. If everything "he" created in the '60s was such a winner, why is everything he created in the '70s such garbage? While at Marvel, Kirby had toyed with the idea of doing a "Captain America of the Future" story - you know, set in a day when Steve Rogers had retired, but a new Cap was needed. Kind of like the "Marvel 2099" books from three decades later. Anyway, it obviously never happened, but the basic idea - normal guy gets turned into super-muscular crusader - ported over to OMAC pretty easily. From there it was just a matter of throwing in some half-baked ideas, visuals that were more memorable than a single word ever said in the comic, and it was straight off to cancellation town only eight issues later! Ah, the book was only created because Kirby's contract said he had to produce 15 pages a week and his other stuff was ending, what do you want? Buddy uses a standard DCUC torso, but he has a new belt and neck brace. 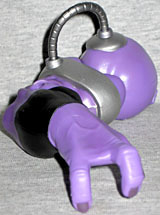 His forearms and shins are molded with three raised bands apiece, to match Kirby's art. His costume is navy blue, yellow and bright orange: it's much more vibrant than the old art, but that's for the better. A dynamo like OMAC shouldn't be bounding around in pastels, should he? Of course not! The Brother Eye symbol is tampographed on his chest, and it is perfectly crisp. The dominating feature is, of course, the mighty mohawk. This isn't some little hipster "fauxhawk" sweep, this is a full-blown mohawk, bigger than Mr. T and Zangief combined. It takes the figure up to a full 7" tall, and is more than ¼" wide by itself. The sculpt on the sides looks like strands of hair forced to stand on end, while the top has a stippled pattern to suggest thickness. You almost wish Kirby were still alive today, just so you could ask him what the hell he was thinking. 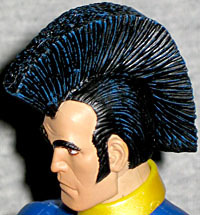 OMAC has no accessories: just a pin and a BAF piece. 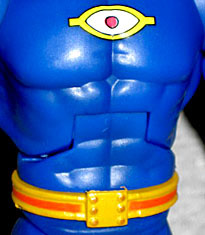 The pin is just a copy of the Brother Eye insignia, as OMAC wears on his chest. It's a really good choice, too - graphically sharp, and certainly a lot better to look at than any of the art from the comics would have been. Remember, Kirby's art was "energetic," not "good." The BAF piece is Validus' right arm, twin to Jemm's piece. You'd think the tube running from the shoulder to the armband would limit the articulation, but it doesn't really: the bicep swivel still turns nearly as far as it normally would, before the physical sculpt of the parts run into each other. Imagine a world in which the way Jack Kirby remembered history was accurate: he created Marvel all by himself, inventing wildly successful characters; then, since it was obviously his work that fans loved, everything he invented for DC became a huge hit, while a non-Kirby Marvel began losing market share as soon as he left. A world where Tobey Maguire starred in three Kamandi movies before it was rebooted, where Eric Bana, Ed Norton and Mark Ruffalo have all played Jason Blood, Chris Hemsworth just wowed audiences as Orion and Joss Whedon is currently directing The New Gods. You know, because Jack Kirby was the one who made characters into stars.